I am teaching English in the Isan region. It is relatively close to other places such as Vietnam, Cambodia, and Indonesia, so this was an attractive feature because I wanted to visit these countries in my free time. 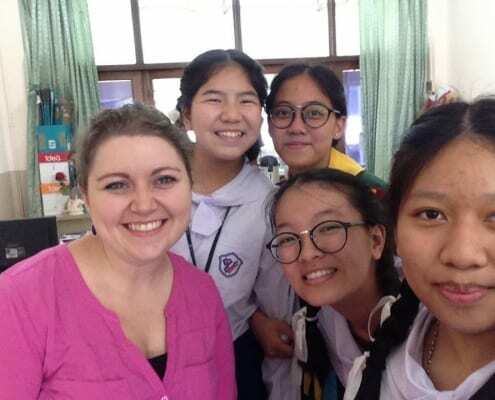 One of the things I love about teaching English in Thailand is that I have a much better work-life balance than my teacher friends in the U.S. I’m able to enjoy an active social life, live in a nice house (which even includes a cleaning service three times a week), and go to a job I enjoy every day. I think there’s something rewarding about making the choice to live in a different country that unites people from diverse backgrounds and creates a basis for strong relationships. About the Author: Caroline Kenward is teaching English in Thailand with BFITS. Get free job placement in Thailand with BFITS and OnTESOL! My TESOL training prepared me to be a reflective teacher and to be patient with my students and to understand that I’m teaching to students with a variety of learning styles. It helped me to adapt more quickly to a classroom environment that requires flexibility, adaptability and a strong understanding of the Communicative Approach. Adapting to a different culture and having a job that requires flexibility and patience leaves you with the choice to roll with the punches (so to speak) or to be miserable. Being able to let go more easily of the anxiety that often comes with change has been the best lesson I’ve had here. Apply Now to Teach in Thailand with BFITS! Language is definitely a challenge – trying to learn a new language with no similarities to your first language takes hard work. However, working towards fluency helps with other challenges related to cultural adaptation. For example, in the United States, efficiency is a highly valued cultural concept whereas in Thailand, there isn’t even a direct translation for the word. Knowing that fosters understanding of the priorities and needs for more peaceful living. This understanding is definitely something I can apply to the classroom to understand the needs of my students more easily.